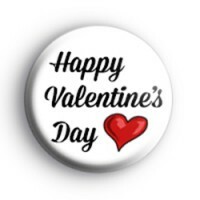 This white 1-inch badge has a simple but romantic message of Happy Valentines Day & a cute red love heart. If you want to be romantic this year & let that special someone know that you love them, then our handmade badges are a cute way to do that. Valentine's Day is a day for celebrating love so what are you waiting for, spread the love! We have hundreds of love and romance badges in the shop so be sure to check out the Valentine's category for lots more designs.